The Church hired University premises to conduct Gaelic classes 1869. These, the earliest known classes at the University, were not official University or degree classes, but were led by a clergyman, Rev Alexander Cameron, and were solely a church initiative. The Rev. 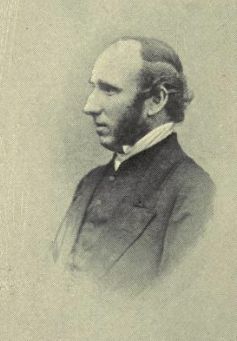 Alexander Cameron (1827-1888), below, picture from Reliquae Celticae. This was driven by the need to prepare trainee ministers for a life of Gaelic preaching and the absence of Gaelic training anywhere at tertiary level – despite ongoing calls from the Gaelic community in Glasgow for Gaelic provision at the University. Cameron’s classes were popular and well-attended: there were over 30 students, mainly divinty students, in his class in 1876 and Cameron had over 70 students in his final year as Gaelic teacher, 1880. Cameron’s classes were seemingly taken over by the Rev. 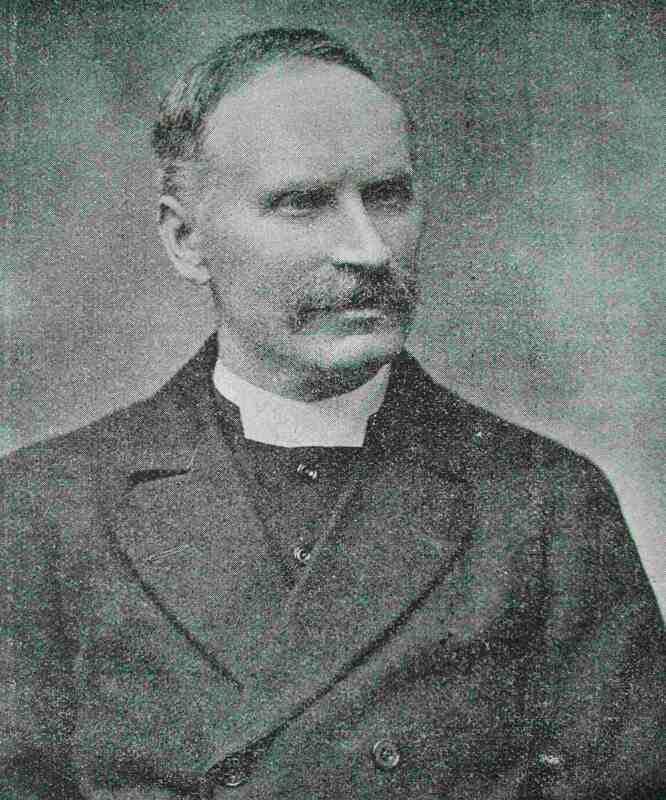 William Ross, Free Church minister of Cowcaddens, from sometime around 1880 up until the mid 1890s. Ross, a native of Caithness and an active figure in the adminstration of Gaelic shools in the Highlands, authored a report on Gaelic education in 1867. He was also something of a Celtic scholar in his own right and had applied unsuccessfully for the Chair at Edinburgh. The Rev. William Ross (1836-1904), left, picture from a memoir, published by his son (1905). Yet while the Church had made some attempt at addressing the deficient training of their ministers, little progress was made at Glasgow in advancing Celtic as a formal subject of study, despite the establishment of the Celtic Chair at Edinburgh in 1882, the successful culmination of a long campaign in that city. The Gaelic community in Glasgow hoped that a similar foundation could be set up at the University of Glasgow. Funding, ostensibly, was the issue that underlay the University’s reluctance to countenance Gaelic or Celtic. This logjam was weakened, although not completely removed by the bequest left the University by the Rev. Dr Gilleasbuig (Archibald) K. MacCallum in 1893. MacCallum’s will stipulated that a Celtic lectureship be established and left monies to that end. The funds were insufficient to pay the salary of a full time lecturer but they were enough to fund a course of lectures in successive years. The Gaelic community monitored progress closely and were unhappy in 1894, that no action was being taken to implement MacCallum’s wishes. By December 1899, An Comunn Oiseanach, together with the Free Church Celtic students’ society presented a petition to the University Court demanding action on the matter of the Celtic lectures. Official inertia had been overcome by mid 1900 and the University engaged Professor Mànus (Magnus) Maclean, to give Celtic lectures which would meet their obligation to fulfil the terms of the MacCallum bequest. Professor Mànus (or Magnus) Maclean (1857-1937), a Skyeman from Fasach, was an expert at both physics and mathematics. He worked for a time at the University of Glasgow as assistant to Lord Kelvin and at the Glasgow Technical College (the forerunner of Strathclyde University) as a scientist. He was the author of a number of scientific articles and books including Modern Electrical Practice (6 vols., London, 1905), Modern Electrical Engineering (6 Vols., London, 1918) and (with Makita Goto), ‘The Electrification of Air by combustion’ (1889). Not only was he an eminent scientist, mixing with people like Lord Reith of the BBC and Albert Einstein, but Maclean was also a capable Celtic and Gaelic scholar. It was to Maclean that the University of Glasgow turned when they set up the Celtic lectures in accordance with the wishes of the late Archibald K. MacCallum as set out in his bequest. The MacCallum lectures were to be given, in English, by Maclean over a three year period. These, the first ever series of official Celtic lectures at the University, were open to the public as well as to the University community (1901-1903). When Maclean delivered the first of these lectures, 24th January 1901 in the Humanity Classroom, he claimed that 10% of the student body (perhaps 200 out of around 2000) at Glasgow could understand Gaelic. Given that nearly 5% of Scots still spoke Gaelic in 1901 and that Glasgow was something of a hub city attracting a disproportionately high number of Gaels this figure seems plausible. Maclean delivered ten lectures in his first season between January and March 1901, all well attended and reported in the Glasgow Herald. Maclean gave further courses of lectures in 1902 and 1903. Maclean was not only prolific as a science author but also brought out two books on Celtic topics, reflecting his work on the Kelly MacCallum lectures: The Literature of the Celts (1902) and The Literature of the Highlands (1904). Prof. Magnus Maclean (left). Image used here by kind permission of Prof. Norman Macdonald, Skye, and Mr Eachann Grant. Maclean was subsequently retained as an external examiner by Glasgow after the first full time lecturer, George Henderson (below), was appointed from 1906. Maclean was also an active participant in various societies in Glasgow including Comunn Gàidhlig Ghlaschu. The prominent Celtic scholar, Kuno Meyer (1858-1919) was a native of Germany. He was a lecturer and then professor of German at the University of Liverpool, England, for 27 years. Meyer was also a pioneer of Celtic studies and held classes in Irish and Welsh at Liverpool, stimulating an interest in Celtic at that University. His growing and parallel interest in Celtic Studies led to strong ties with Ireland in particular and had a long association with various institutions in Cork and Dublin and later worked in the USA. 84344) reproduced by kind permission of the National Portrait Gallery, London under a Creative Commons licence. Meyer returned to Glasgow again at the end of 1904 to begin his second series of lectures. He spoke, 25 November 1904, on the theme of ‘the origins of Celtic literature’ to an audience which included Principal Story in the Greek classroom. Other topics covered in succeeding weeks included the invasions of Celtic tribes and the influence of the druids. Meyer finished his second course of lectures, 10 February 1905, with a lecture on old pagan Irish tales featuring Cuchulain and Táin Bó Chuailgne. It took over a year before Meyer came back to Glasgow to give his third and final course of six lectures on the broad theme on ‘the Influence of Celtic Literature on that of Europe’. He spoke on Matthew Arnold and the genres of Celtic literatures (03/02/1906), the impact of Celtic languages on European literatures as evinced by loanwords and etymology (10/02/1906), Gaelic prose in comparison with Welsh literature and the Mabinogion (17/02/1906), Geoffrey of Monmounth and Arthurian legends (24/02/1906), the Voyage of Bran and the impact of tales such as these on Medieval Europe (02/03/1906). Meyer’s final lecture as Kelly-MacCallum lecturer at Glasgow was on the theme of James MacPherson and Ossian (12/03/1906). He brought his lecture to a close by expressing his confidence that the University of Glasgow would be able to provide a more substantial place for Celtic and satisfy the appetite for Celtic Studies in the city of Glasgow that his lectures and those of predecessor, Magnus Maclean, had helped to encourage. 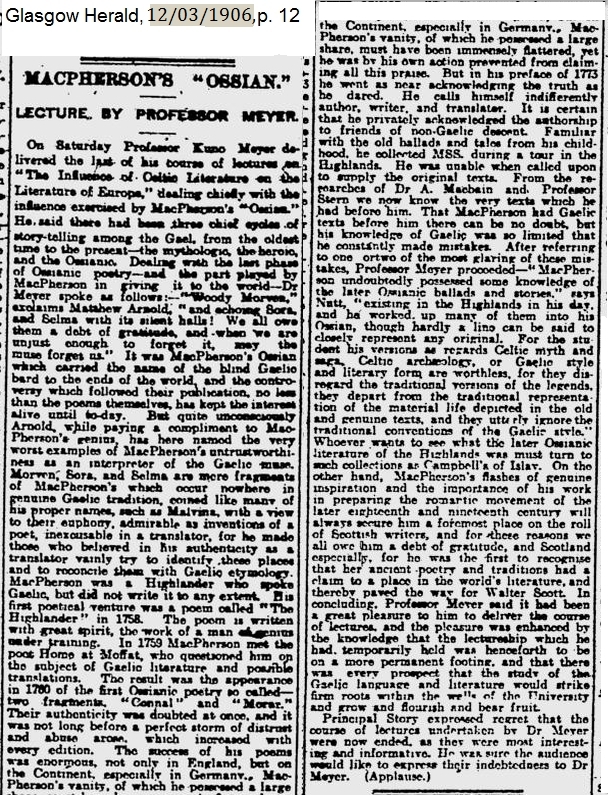 An image of report in the Glasgow Herald of the final lecture by Professor Kuno Meyer at Glasgow on MacPherson and Ossian. With thanks to the Herald & Times Group for permission to reproduce this. Meyer was also the honorary president of An Comunn Oiseanach in 1904-05 and 1905-06, and addressed Comunn Gàidhlig Ghlaschu, 6th March 1906, on the topic of ancient Gaelic poetry from old Irish manuscripts. Meyer called for the production of a detailed catalogue of all the extensive older materials and argued that scholars needed training to be equipped for this task. Both the lecturer and his message were well received by Comunn Gàidhlig Ghlaschu, Meyer’s reputation suffered subsequently – at least in Scotland (and England) – due to his vociferous support for his native country during the Great War. Professor Angus Matheson, who had himself served in the intelligence services in the Second World War noted, surely with tongue in cheek, that Meyer had been a ‘German spy’ but there can be no doubt he made an important contribution to the introduction of Celtic at Glasgow. Highland Association for Scotland, per J.A. Mackay, Dundee. Each of these subscribers promised to pay the sum they had pledged in five annual instalments to the University. This was now sufficient to pay for the appointment of a Celtic lecturer for a five year period from 1906. Funding for the lectureship was put on a more sustainable footing when the University topped up the MacCallum bequest with another bequest left them by Alexander Fleming (1824-1909). Fleming was a self-made Glasgow ironmaster who split his fortune between various public bodies after his death including the University of Glasgow. Fleming was not, at least according to his census returns, a Gaelic speaker although he was originally from Kintyre. He had come to Glasgow as early as 1837 but retained links to the Highlands and to his home community. ‘Alexander Fleming of Kilmaho, ironmaster,’ was made a member of the Glasgow Highland Society, 1892. As someone who retained links with the Highland community throughout his life he would surely have approved of the way in which the University made use of his money for consolidating the position of the Celtic & Gaelic lectureship (amongst other uses of these monies). As a result of these fundraising initiatives Rev. Dr George Henderson, from Kiltarlity, Inverness-shire, was appointed as the first full time lecturer of Celtic at Glasgow in October 1906. Rev. Dr George Henderson. This image taken from ‘the Celtic Review’, viii (1912-13), 246-7. Henderson had been a pupil of Raining’s School, Inverness, and had been taught there by Celtic scholar, Dr Alexander MacBain. Henderson was educated at the Universities of Edinburgh, Oxford, Berlin and Vienna. 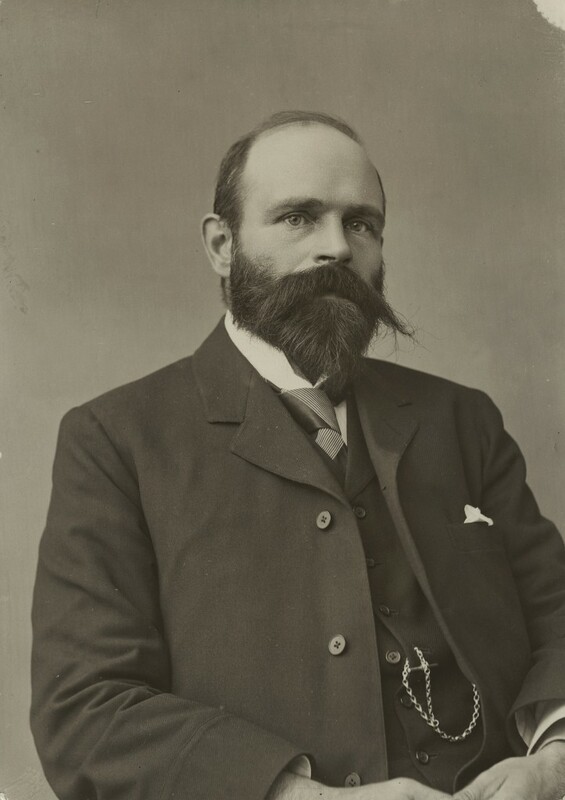 He was the author of many books, articles and editions of texts: the best known of these, perhaps, are ‘Dàin Iain Gobha’ (1893-6), ‘Leabhar nan Gleann’ (1898) and ‘The Norse Influence on Celtic Scotland’ (1910). He was the parish minister at Eddrachilles, Sutherland, prior to his selection for the post of Celtic lecturer at Glasgow in 1906. Henderson had an impressive lists of referees to support his application for the post, Kuno Meyer among them, together with scholars from Oxford, Edinburgh and Vienna. Henderson was the first ever lecturer to offer students courses qualifying for an MA degree at the University of Glasgow from 1906 onwards. Here is how the Celtic courses offered by Henderson appeared on the University course catalogue, session 1907-08. The Course now qualifies for graduation in Arts. Any student who attends with a view to this must previously have passed a preliminary examination in Scottish or Irish Gaelic, or in Welsh, including translations from and into English, with grammatical, literary and philological questions. Language. The Principles of Celtic philology, phonology, grammar of the Celtic language, Introduction to Old Irish, Windisch’s Irish grammar (translated by Moore); Strachan’s Paradigms and Selections from the Old Irish glosses. Windische’s Irische Texte mit Wörterbuch. Togail Brudne Da Derga, ed., Whitley Stokes; Meyer’s Early Irish Texts; Leigheas Cois O’ Cein (ed. Henderson). The Death Tales of the Ulster Heroes, by Kuno Meyer (Todd Lecture Series, Royal Irish Academy). The Poems of Alexander Macdonald of Ardnamurchan. Selections from the standard literature of the modern period of Scottish Gaelic. Readings from facsimiles of Old Gaelic texts. The class meets daily at 4 p.m. The book in which Rev. Dr Henderson kept a note of his students’ attendance and results is still held in the Celtic & Gaelic subject area. An image of a page from this book can be seen here on the right. The first two student names that appear in this list are Malcolm Laing (Loch na Madadh, North Uist) and John Mackay Maclennan (from Durinish, Ross-shire). This notes that they had passed their exams. Henderson’s own name can be seen in the margin beside this note together with the signature of the external examiner, Professor Magnus Maclean. 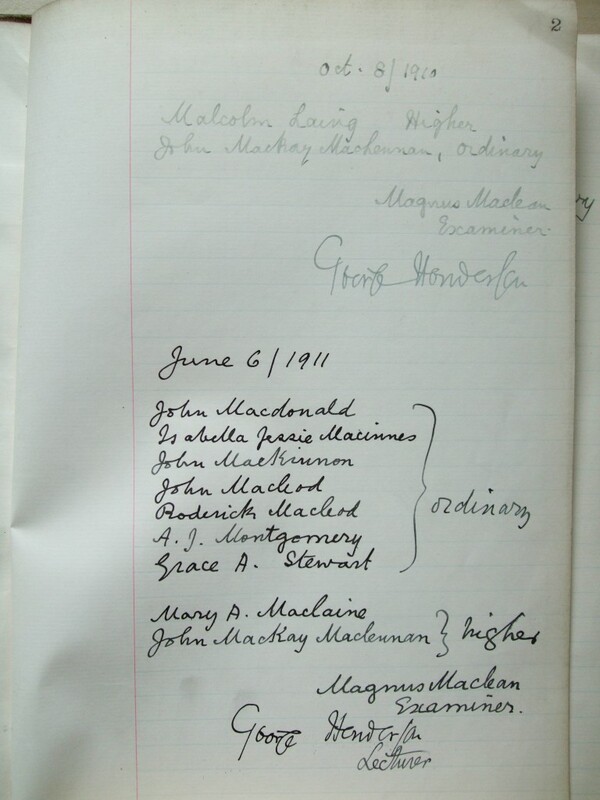 Another list can be seen on the same page of the names of other successful candidates in the 1911 diet, again with the signatures ‘Henderson’ and ‘Maclean’ beside their names. No women could attend the University until session 1892-93, and they suffered many obstacles in the struggle to get the same opportunities open to male students. These lists of names of the earlier Celtic students, 1906-1914, show that this subject appealed to both genders as soon as it became available to study. The first female student to enrol for Celtic was a ‘Mary A. MacLaine’ from Glasgow. Mary was a capable student who was awarded a prize in Henderson’s class. She did not, however, complete her studies although the reasons for this are unclear. Information gleaned from the University records shows the names, addresses (term-time as well as home addresses) and fathers’ occupations of the students for the years 1906-07 until 1913-1914 which can be seen by clicking on the following link to a PDF file: GUA R9 & R8 Oileanaich 1906-07 to 1913-14. Henderson died aged only 46 in 1912. A ‘K.M.’, possibly Kenneth Macleod, wrote an obituary for him which appeared in the Glasgow Herald, 29/06/1912. The late Henderson’s successor as Glasgow lecturer in Celtic was another cleric, the Rev. Dr George Calder (1859-1941). Calder was a native of Kincardineshire, a non-Gaelic speaking area. He attended Aberdeen University, taking Latin and Classics, graduating MA there in 1881. Left, a photograph of the Rev. 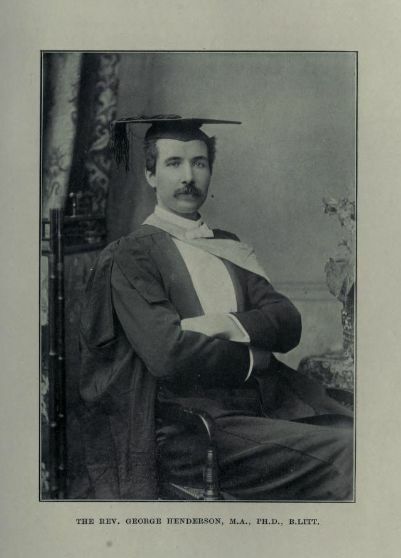 Dr George Calder, taken from the ‘Celtic Monthly’, 20 (1912), 211. He became a Classics teacher in Rothesay and he then took a divinity degree at the University of Edinburgh (1884). He went as a missionary to Struan, Perthshire, 1886, and while based in this area he acquired Gaelic – so successfully that he was able to preach his first Gaelic sermon at Blair Atholl in 1893. Calder spent a period of time as minister at Ardgour where he gave weekly sermons in Gaelic (1893-4). He went on to become minister in the predominantly Gaelic speaking parish of Strathfillan, Perthshire, 1894-1912. Calder had taken an interest in Celtic matters, probably while a divinity student at Edinburgh and he had attended some of Professor Mackinnon’s Celtic classes. He subsequently pursued this interest and spent periods of study at Dublin with scholars such as John Strachan, Rudolf Thurneysen and Kuno Meyer. Calder published a number of editions of older Irish texts, a Gaelic grammar book (1923), an edition of Donnchadh Bàn Macintyre’s poetry (1912) and an edition of the poems of Uilleam Ross (1937). Calder’s initial appointment as lecturer of Celtic at Glasgow University, 1st October 1912, was on a five year contract but he remained in post until his retirement in 1935. Calder’s ‘dry’ teaching style was not appreciated by at least one of his students, Rev Thomas M. Murchison (1907-84, alias Tòmas MacCalmain), who took Celtic classes at Glasgow (session 1928-29) as part of his MA degree. Professor W.J. Watson (1912) and Professor Donald Meek (2006) have both been critical of Calder’s approach towards the editing of Scottish Gaelic texts (namely his editions of the poetry of Donnchadh Bàn and Uilleam Ros). However, Calder’s editions of Old Irish texts such as Imtheachta Aeniasa: the Irish Aenid (1907) and Auraicept na n-Eces (1917) are still widely used. And, while Thomas Murchison did not enjoy Calder’s tuition, Calder’s Celtic classes – if the number of graduates are any measure of this, were outstandingly successful. 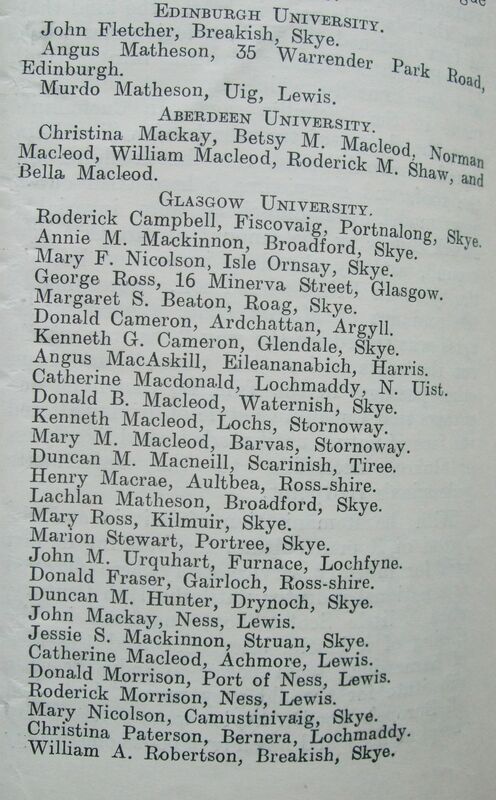 A list of graduates, right, from the year 1931, published under the heading ‘The M.A. in Gaelic,’ as it appeared in An Gaidheal, 27/1 (an Dàmhar, 1931), 14. Of the three Scottish Universities that taught Celtic, Glasgow appears to have had the healthiest number of students. Six Celtic Studies students graduated from Aberdeen in 1931, three from Edinburgh, but a remarkable 28 from Glasgow which must have meant a heavy workload for Calder given that Celtic was a single lecturer department during his tenure. Annual Gaelic religious services were held at the University at this time. These seem to have been conducted by ministers serving the various Gaelic congregations in Glasgow, with Calder reading passages during the service. They were held in Bute Hall and well attended by students, including members of An Comunn Oiseanach as well as staff. The Principal, Sir Dòmhnall MacAlister, was present on at least one occasion, 1926. Calder was praised by a subsequent Principal, Sir Hector Hetherington, as ‘gentle and learned.’ He retired to Killin, Perthshire, in 1935 and he was given an honorary doctorate in divinity by the University of Glasgow, 1936. Calder’s obituary, written by a ‘J.C.’, 1941, noted how student numbers had risen continuously during his time and were a mark of how successful he had been as a Celtic lecturer. 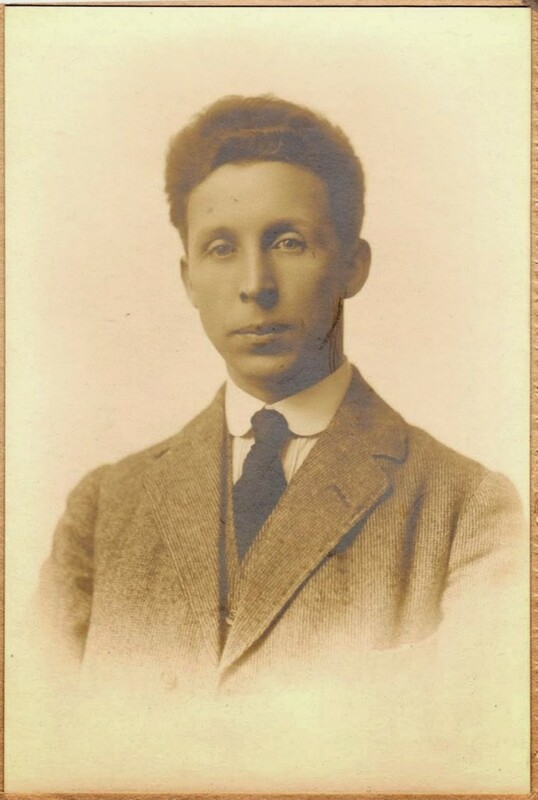 Calder’s successor as Celtic lecturer at Glasgow was James Carmichael Watson (1910-1942), son of the Edinburgh Celtic professor, William J. Watson and Ella Carmichael. Watson brought a youthful vigour to the department and it was during his brief period as lecturer that the Ossianic Club started to take steps to raise money towards the long held ambition of founding a Celtic chair (below). This image of Professor J.C. Watson, left, taken from Ossian, 1957. Watson published a number of well regarded editions of Irish and Scottish Gaelic texts including The Gaelic songs of Mary Macleod (1934). 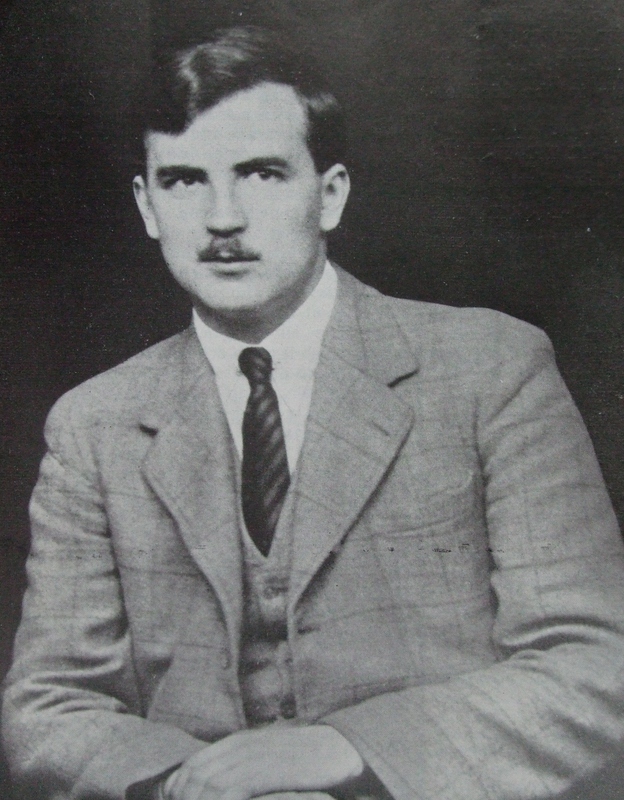 Watson was only in post at Glasgow for three years before accepting an invitation from Edinburgh University to follow his father as Professor of Celtic in his native city, 1938. Professor J.C. Watson was lost at sea while on active service during the war, 1942. 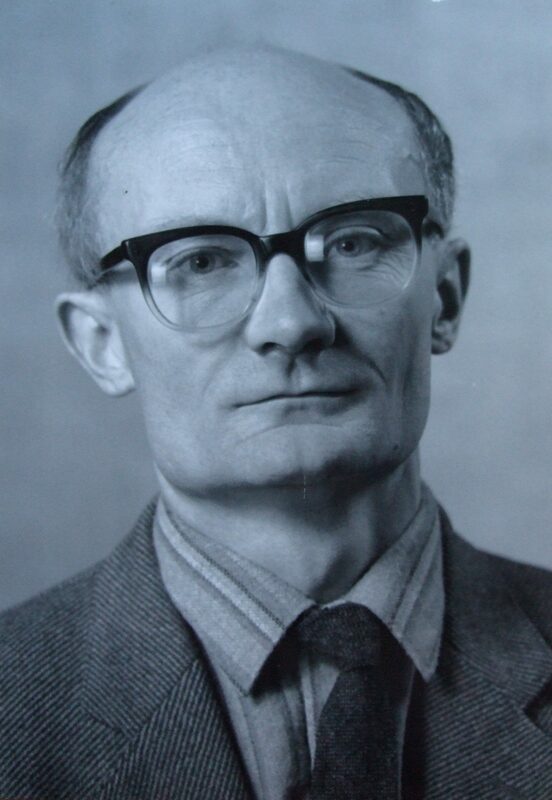 Angus Matheson or Aonghas MacMhathain (1912-62) was born in Harris and raised in North Uist. His brother was the well-known Gaelic scholar, Rev. William Matheson, who worked at the Department of Celtic at the University of Edinburgh. 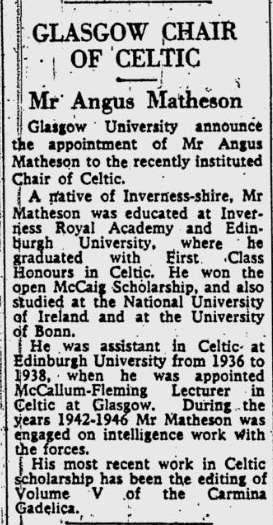 Angus Matheson was head of the Department of Celtic from his arrival as Celtic lecturer at Glasgow in 1938 (which coincided with the appointment of another lecturer in Celtic, Kenneth Jackson, later Professor of Celtic at Edinburgh). Professor Angus Matheson (left, image by K.N. Macdonald) taken from Ossian, 1957. The image reproduced here by permission of the committee of An Comunn Oiseanach, 2014. The Glasgow Herald, right, carried a report on the appointment of Angus Matheson to the Chair of Celtic, 19th November 1956 (p.6). Cutting reproduced here by kind permission of the Herald and Times Group. Matheson served in the armed forces during the war from 1942, where the intelligence services presumably utilised his knowledge of German (Matheson had taken postgraduate study at Bonn). 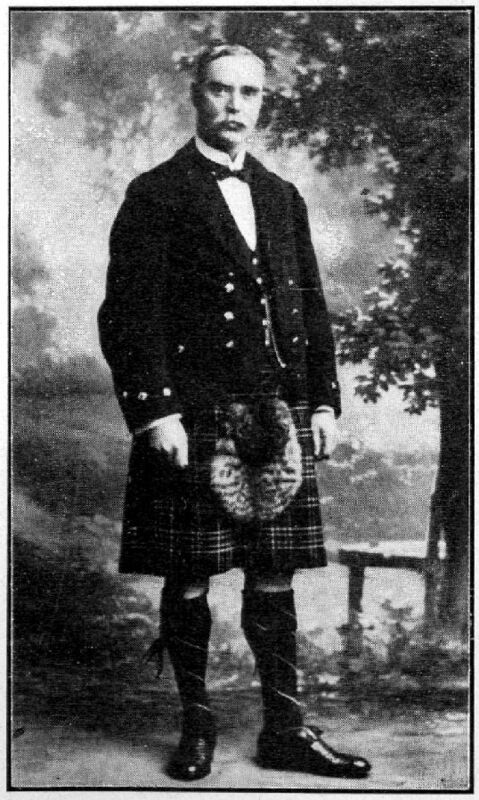 In Matheson’s absence the University brought in a Skyeman, Alexander Nicolson (alias Ailig MacNeacail, MA, Glasgow, 1913), to cover his Gaelic classes. 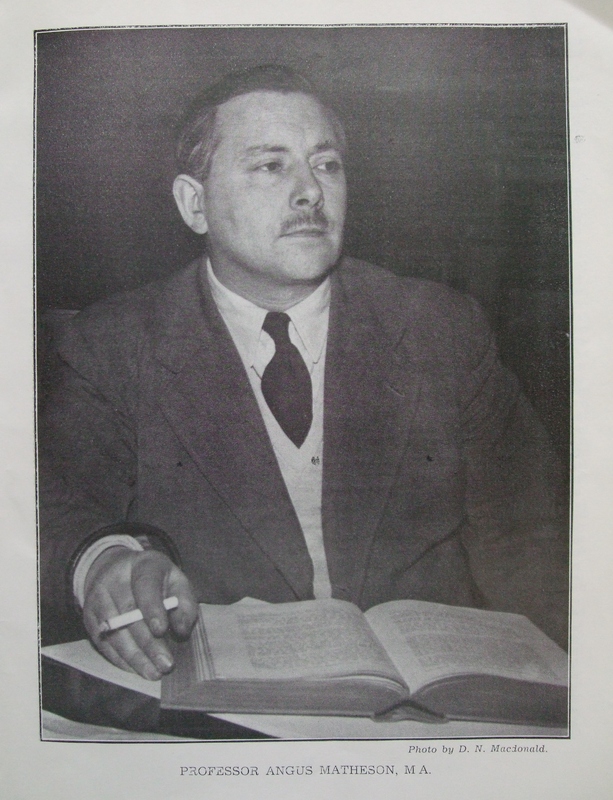 Nicolson (1884-1966), author of a number of works relating to the culture and language of the Gaidhealtachd, including the History of Skye, was lecturer at Jordanhill College. He stood in for Matheson until Matheson’s return to the University of Glasgow in 1946. Ailig MacNeacail alias Alexander Nicolson, pictured here on the right, Lecturer at Jordanhill College and interim Celtic Lecturer, 1942-46, at the University of Glasgow. Image reproduced here with the assistance of Mr Cailean Maclean and by the kind permission of Mr Alasdair Beal, Alexander Nicolson’s grandson. Matheson returned to his post at Glasgow following demobilisation at the end of the war. However, in 1937, just prior to Matheson’s appointment at Glasgow, a fresh initiative had been launched in an attempt to establish a chair of Celtic at Glasgow. 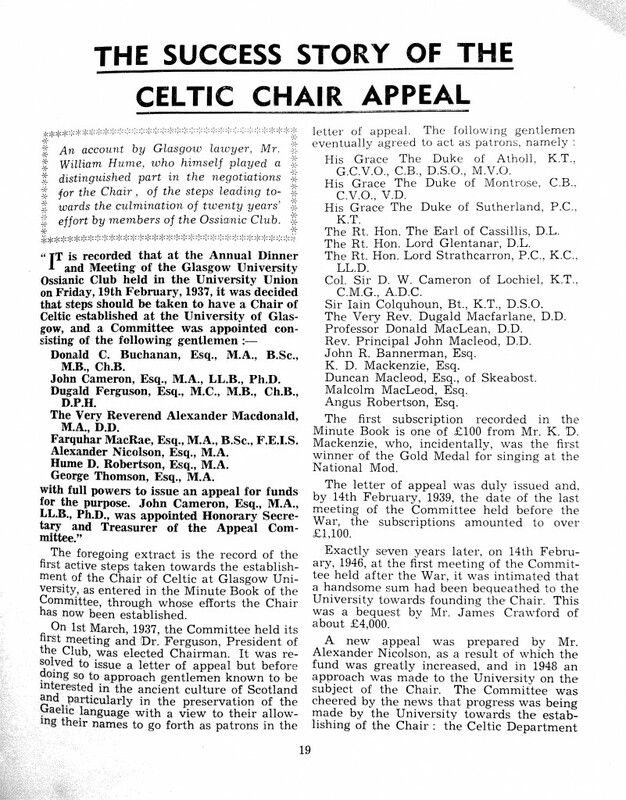 The Ossianic club (graduates associated with An Comunn Oiseanach) and their friends started a campaign in 1937 to raise the necessary funds to endow a chair of Celtic. The target they had to reach was £25,000 (worth, perhaps, around £750,000 in modern terms). Although a promising start was made the war put a brake on further progress. Professor Angus Matheson pictured here on the left (photograph, Roinn na Ceiltis). This image of a newspaper column, below, shows how Matheson’s appointment to the newly founded Chair of Celtic was reported in the Glasgow Herald (19th Nov. 1956, p. 6). Reproduced by kind permission of the Herald & Times group. An account of this was written by one of the fundraisers, William Hume, ‘The Success Story of the Celtic Chair Appeal’ which appeared in a special edition of An Comunn Oiseanach’s magazine ‘Ossian’ (1957). This account can be seen by clicking on the two thumbnails here, left, of images of an essay written by William Hume in ‘Ossian’ (1957). Reproduced by kind permission of An Comunn Oiseanach (2013). Another image (below) of Professor Matheson at the Celtic International Congress, Dublin, 1959, in the company of other prominent Celtic scholars, Brian Ó Cuív, David Greene agus Carl Marstrander. Another prominent scholar, Cecile O’ Rahilly can be seen in the background. Image courtesy of Roinn na Ceiltis, Oilthigh Ghlaschu. Professor Matheson had only occupied the new chair of Celtic a small number of years before his untimely death in 1962 aged only 50. The next incument of the chair of Celtic at Glasgow was Derick S. Thomson (alias Ruaraidh MacThòmais, 1921-2012). Thomson was a native of Pabail, Point, Isle of Lewis. He was no stranger to Glasgow having previously worked at the department of Celtic between 1949 and 1956 as a lecturer of Welsh. He left Glasgow for Aberdeen to take up a position at that University as a lecturer in Celtic. Thomson returned to Glasgow as Professor of Celtic in 1962 remaining in post until his retirement in 1991. Thomson (pictured, above, right) was not only one of the leading scholars in the Scottish Gaelic world during the second half of the twentieth century but he pushed the cause of Gaelic forward on a broad number of fronts. He was one of the leading Gaelic poets of his generation, an active Gaelic campaigner and enterpreneur. 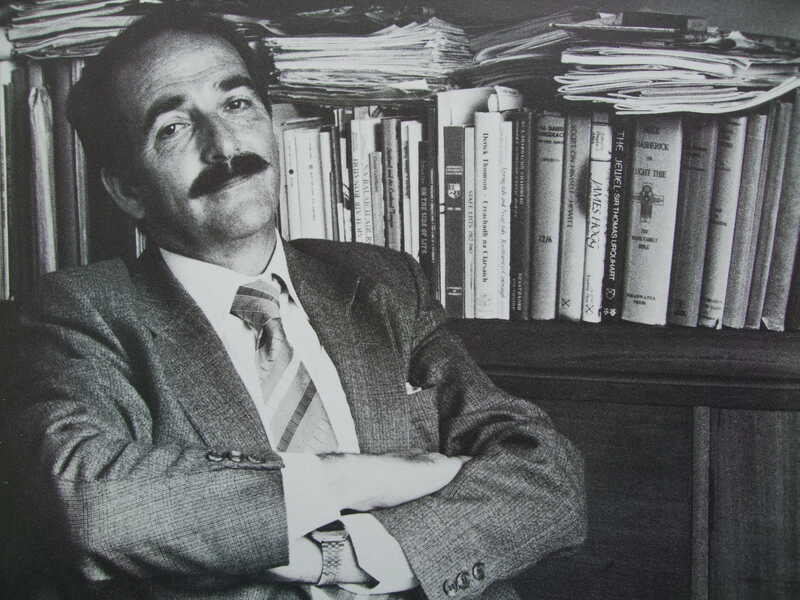 He edited the long running Gaelic periodical, Gairm, ran the Gaelic publishing company of the same name, founded the Gaelic Books council, together with teaching and running a busy Celtic department. Professor Donald E. Meek has written a warm appreciation remembering the man and his achievements which can be seen here. A website is currently being developed by Petra Johanna Poncarová which will examine aspects of Thomson’s life and work as a poet, scholar and Gaelic activist. This can be seen by clicking here. This image, left, reporting the appointment of Professor Thomson, taken from the ‘Glasgow Herald’, 05/08/1963, p. 6, and reproduced by kind permission of the Herald & Times Group. Further information about Professor Thomson, especially on his role as Gaelic poet, together with video clips of him being interviewed can be seen at the BBC’s Làrach nam Bàrd website by clicking here. This image, below, shows staff at the Department of Celtic, 6 Lilybank Gardens, c. 1966. 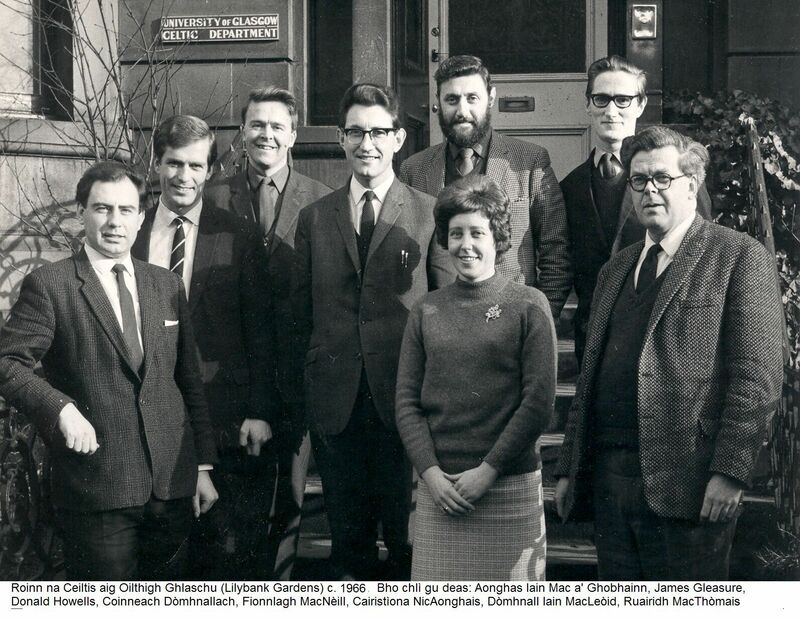 Left to right, Angus John Smith, James Gleasure, Donald Howells, Kenneth MacDonald, Finlay MacNeill, Christina Macinnes, Donald John Macleod, and Professor Derick S. Thomson. Image by permission of Roinn na Ceiltis is na Gàidhlig. 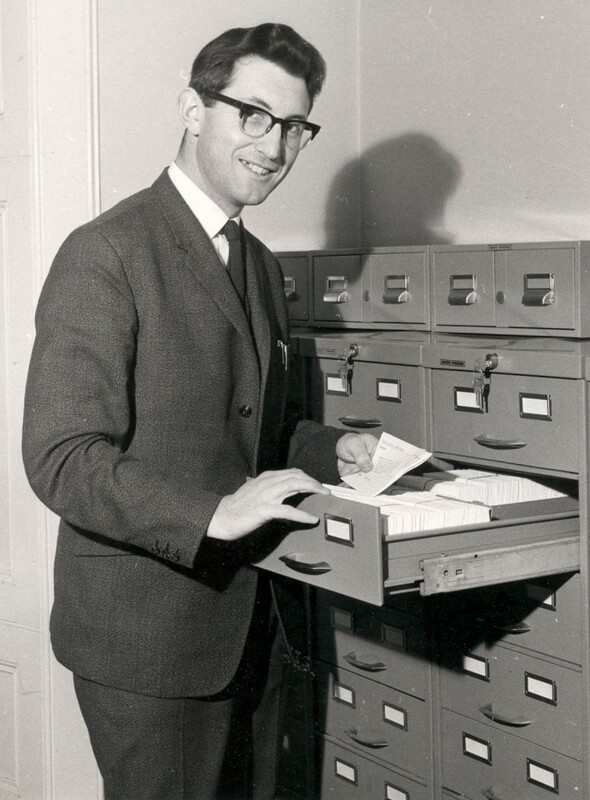 Another image, below, right, can be seen of Mr Kenneth D. Macdonald (alias Coinneach Dòmhnallach) probably taken around the time of the launch of the Historical Dictionary project, 1966. Both images used by permission of Roinn na Ceiltis is na Gàidhlig. 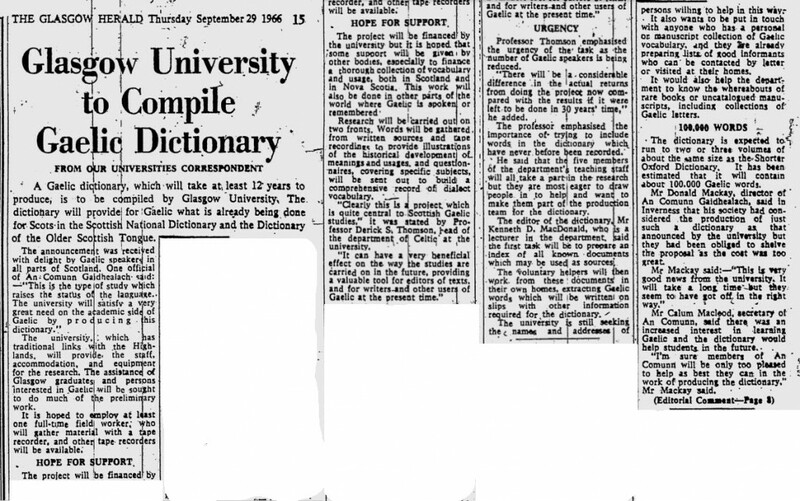 A newspaper report of the foundation of the Historical Dictionary appeared in the Glasgow Herald, 29th September 1966. This image from the Glasgow Herald, 29/09/1966, pg. 15, reproduced by kind permission of the Herald & Times Group. www.heraldscotland.com. A detailed account of the history of Celtic & Gaelic at the University of Glasgow during the twentieth century was given by Professor Donald E. Meek in the form of a talk at the first annual Celtic & Gaelic Angus Matheson memorial lecture, 5th December 2006. Professor Meek was a student at Glasgow (1967-71), graduating with an MA and later with a PhD from Glasgow (1982). He also worked as an Assistant Editor on the Historical Dictionary at the Department of Celtic, University of Glasgow, 1973-1979. Professor Meek has published a written form of his lecture from 2006 on the internet. This has the title “FROM MAGNUS MACLEAN TO ANGUS MATHESON: GLASGOW AND THE MAKING OF CELTIC STUDIES IN SCOTLAND.” This can be seen by clicking here. Professor Thomson’s successor was Professor Donald MacAulay (alias Dòmhnall MacAmhlaigh) who came to Glasgow from the University of Aberdeen. 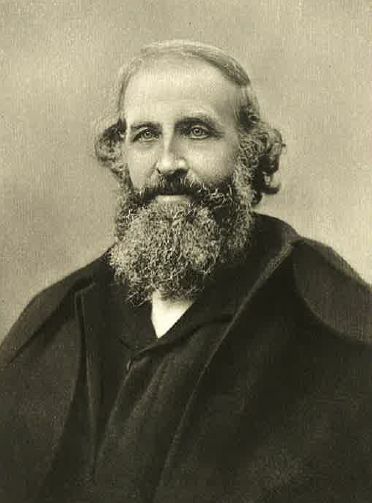 MacAulay, a native of Beàrnaraigh, by Lewis, was, like his precessor, not only a distinguished Celtic scholar but is also well known as a prominent Gaelic poet. Further information on Professor MacAulay and his poetry – including clips of video interviews with the poet himself can be seen at the BBC resource ‘làrach nam bàrd’ by clicking here. 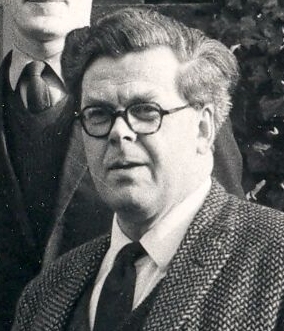 Professor Donald MacAulay, head of the Department of Celtic, 1991-1996. Macaulay is pictured here at the University of Aberdeen where he was head of Department of Celtic before coming to Glasgow. This picture was taken by Angela Catlin who has kindly given permission for it to be reproduced here. The photograph was originally published in Angela Catlin’s book, Natural Light: portraits of Scottish Writers (Paul Harris, Edinburgh, 1985). Professor MacAulay (pictured here on the left) remained as head of department at Glasgow until 1996. Professor MacAulay, sadly, passed away on the 28th February 2017. To see a tribute to Professor Macaulay please click here. 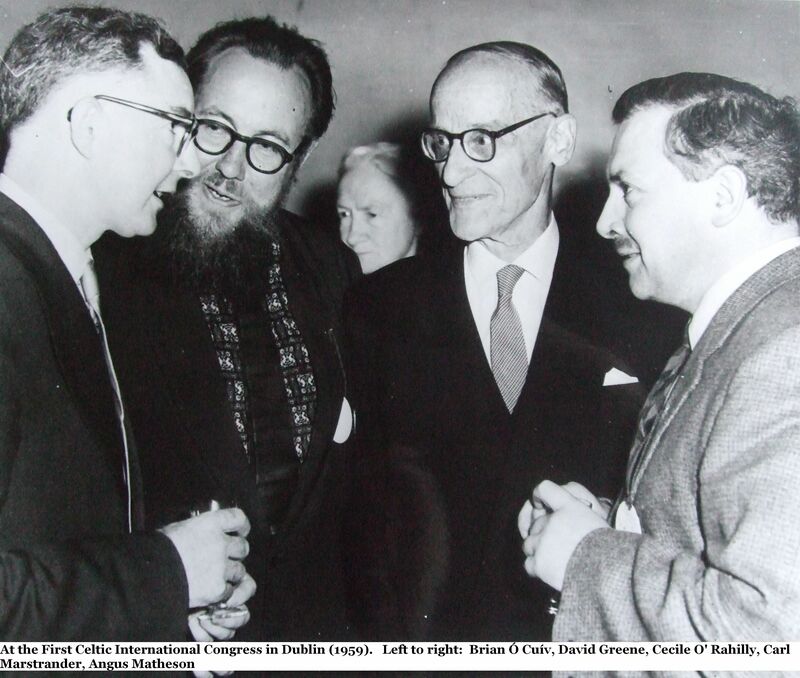 After Professor MacAulay left the post in 1996 the next incumbent of the Chair of Celtic at Glasgow was Professor Cathair Ó Dochartaigh (a native of Derry, pictured on the right). Professor Ó Dochartaigh, an expert in Gaelic and Irish linguistics and dialects, remained in post until his retirement in 2004. Cathair (Cathal) Ó Dochartaigh, sadly, passed away in 2015. For more on Professor Ó Dochartaigh please click here. 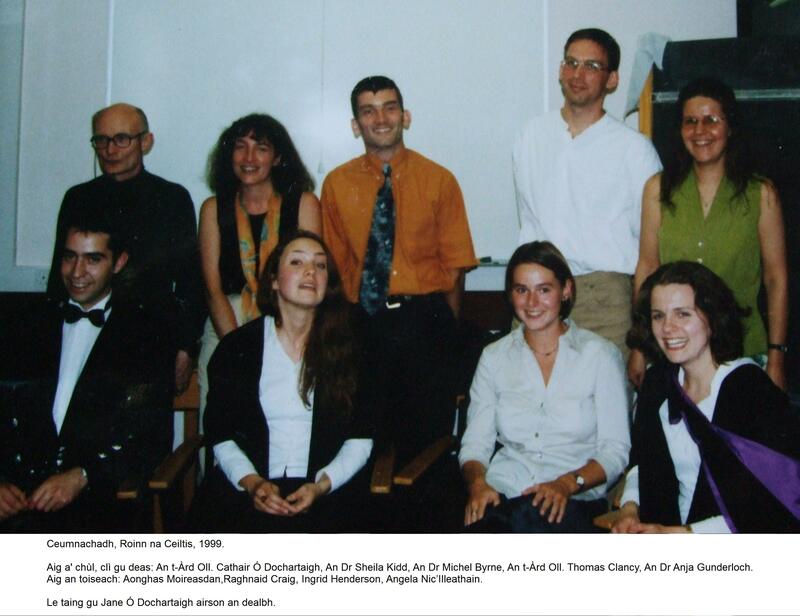 A number of new members of staff arrived during Professor Ó Dochartaigh’s watch, some of whom are pictured here in a photograph from around May 1999 (below). The members of staff pictured here, below, standing, left to right, Professor Cathair Ó Dochartaigh, Dr Sheila Kidd, Dr Michel Byrne, Dr (now Professor) Thomas Clancy and Dr Anja Gunderloch (now a member of staff at Edinburgh). The students pictured here, seated, on their graduation day are, left to right, Aonghas Moireasdan, Raghnaid Craig, Ingrid Henderson and Angela Nic’Illeathain. Sgeul na Gàidhlig is grateful to Jane Ó Dochartaigh for sharing these photographs with us and for permission to use them here. 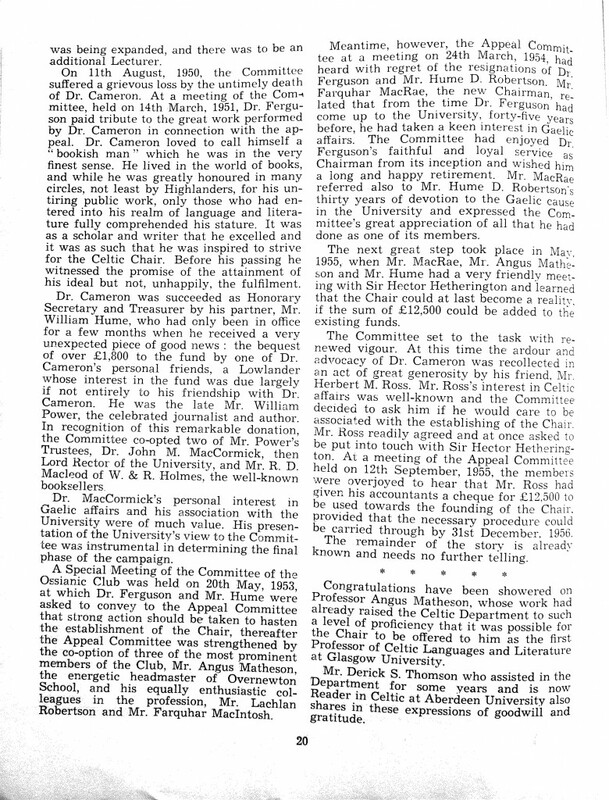 The Chair of Celtic was established, as related above, in 1956, a post filled initially by Professor Angus Matheson. A summary list follows, below, of all the incumbents of the Chair of Celtic, followed by an account of the new Chair of Gaelic at Glasgow, the first of its kind in Scotland. 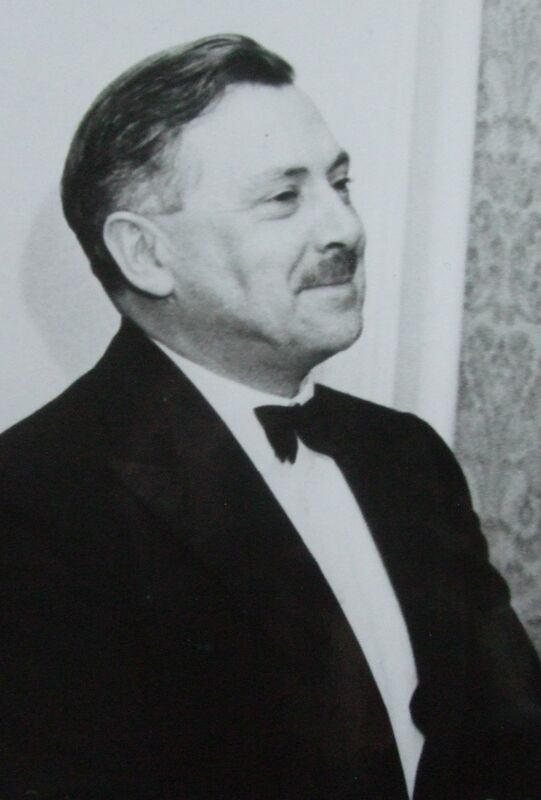 Angus Matheson (alias Aonghas MacMhathain, 1956–62). Professor Thomas Owen Clancy (pictured on the right) is the current holder of the Chair of Celtic at the University of Glasgow. Professor Clancy has wide ranging interests within the Celtic field and is an expert on (among other things) the older languages and cultures of Scotland and Ireland. Further information, including a listing of Professor Clancy’s publications, can be seen by clicking here. 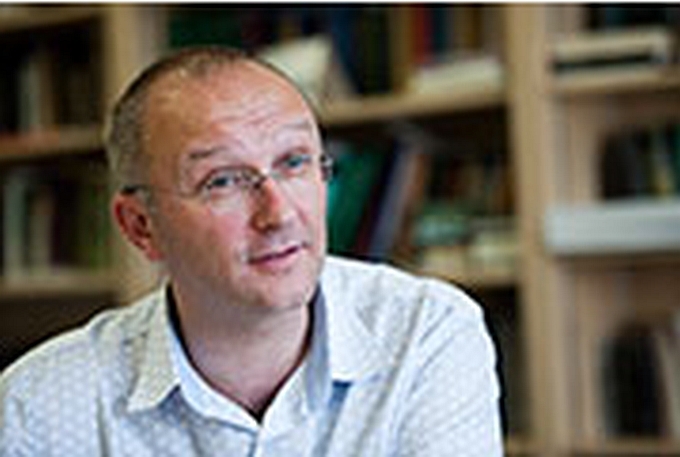 Professor Clancy has also been involved with and led many research projects. A new website, ‘saintsplaces’, has been launched which showcases the findings of one such project. This explores the occurence of hagiotoponyms (saints’ names as placename elements) throughout Scotland. This can be seen by clicking here. Roibeard Ó Maolalaigh (2005-2010). Cathair na Gàidhlig was a new personal chair instituted for Professor Roibeard Ó Maolalaigh when he arrived at the University of Glasgow in 2005 (2005-2010). Roibeard Ó Maolalaigh (2010-). Professor Ó Maolalaigh had held a personal chair since 2005, however, in 2010, the University established a new chair of Gaelic, the first of its kind in Scotland. Its first and current incumbent is Professor Roibeard Ó Maolalaigh. Rob(by) was born in Dublin and took undergraduate and postgraduate degrees at University College in that city. Robby went on to further postgraduate study in Celtic at the University of Edinburgh where he completed a PhD. He stayed at the University of Edinburgh as a lecturer followed by a spell at the School of Celtic Studies, Dublin Institute for Advanced Studies, where he was Assistant Professor. 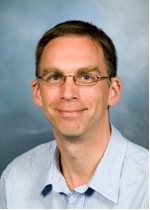 He has worked as Professor of Gaelic at the University of Glasgow since January 2005 and was appointed to the established Chair of Gaelic in April 2010. Professor Ó Maolalaigh is also currently (2015-) the Vice-Principal and Head of the College of Arts at the University of Glasgow. He set up the project Digital Archive of Scottish Gaelic in 2006 and Corpas na Gàidhlig in 2008. Other digital projects in which he has been involved include Bibliography of Irish Linguistics and Literature and People of Medieval Scotland 1093–1314. Robby’s main area of research interest is in Gaelic languages and linguistics from earliest times to the modern era and he has published extensively on these themes. Further information on Professor Ó Maolalaigh’s research interests, publications and projects can be found on his staff webpage by clicking here. Rev. Alexander Cameron. J. Kennedy, ‘Memoir of Dr Cameron’, in A. MacBain & J. Kennedy, eds., Reliquiae Celticae. Texts, papers and studies, left by the late Rev. Alexander Cameron (2 vols, Inverness, 1892), vol. i, xvii-clxxi, at cxlvii, clxi-clxii. D.E. Meek, ‘From Magnus Maclean to Angus Matheson, Glasgow and the Making of Celtic Studies in Scotland.’ C. Laing, An t-Urramach Iain MacRuairidh. A Bheatha agus na Sgrìobhaidhean aige (Clàr, Inbhir Nis, 2013), 4-5, 53-123. Rev. William Ross. S.E.J. Rettie, ‘The Urban ministry of William Ross and Cowcaddens Free Church (1883-1904) in comparative historical context’ (PhD thesis, University of Aberdeen, 2010), 79-81. J.M. E. Ross, William Ross of Cowcaddens. A Memoir by his son (London, 1905), 2, 16-17, 34-37, 63, 81-83, 233. Beginnings. Further information on the Rev. Alexander (Alasdair) Cameron, the Rev. Dr Archibald (Gilleasbuig) K. MacCallum and the beginnings of Celtic as a subject at Glasgow can be found in Donald E. Meek’s article, referred to above and also in the following sources. A. Matheson, ‘The Department of Celtic in the University of Glasgow’ in Ossian, 1957, 23-26, at 23. The last will and testament of the Rev. Dr A.K. MacCallum, NRS, SC 36/51/108/636-656. Glasgow University Archive Services, GUA Sen 1/1/8/138/321. GUA Sen 1/1/18/325, ‘University Records, Minutes of Senate, 17 January 1901′. GUA 72557. Comunn Gailig Ghlascho. Transactions of the Gaelic Society of Glasgow. Vol. 2 (1891-94), ix. Glasgow Herald, 18/12/1899, page 6. References to Professor Magnus (Mànus) Maclean. A short but detailed account of the life and achievements of Professor Maclean, including some anecdotes about his encounter with Albert Einstein in 1933, can be found in N. Macdonald & C. Maclean, The Great Book of Skye. From the Island to the World. People and place on a Scottish Island (Portree, 2014), 291-294, 436. The first series of Maclean’s Celtic lectures at Glasgow were reported as follows in the Glasgow Herald: ‘McCallum Celtic Lectureship’ (25/01/1901, pg. 4); ‘The MS legacy of the past’ (GH, 01/02/1901, p. 6); ‘The Scottish Collection of Gaelic MSS’ (GH, 08/02/1901, p. 13); ‘The Mythological Cycle’ (15/02/1901, p. 10); ‘The Heroic Cycle’ (GH, 22/02/1901, p. 10); ‘The Ossianic Cycle’ (22/02/1901, p. 10); ‘St Patrick, the pioneer of Celtic writers’ (GH, 08/03/1901, p. 13); ‘St Columba & the dawn of letters in Scotland’ (GH, 15/03/1901, p. 13); ‘The Master gleaners of Gaelic poetry’ (GH, 22/03/1901, p. 9); ‘The master scholars of Gaelic literature’ (GH, 29/03/1901, p. 11). Professor Maclean was named as the external examiner for the newly instituted Celtic degree course in June 1906. Glasgow University Archives, Sen 1/1/20/224, University Records, Minutes of Senate, 5 June 1906. For the entry on Professor Maclean on the University of Glasgow Story site click here. References to Professor Kuno Meyer. Dr Dagmar Schlüter, a former lecturer in Celtic & Gaelic at Glasgow (2009-2010), wrote an essay which looked at Meyer’s time at Glasgow and located this within the wider context of his career and Celtic scholarship. D. Schlüter, ‘Kuno Meyer in Glasgow: some preliminary remarks’ in F. Bock, D. Bronner & D. Schlüter, eds., Allerlei Keltisches. Studien zu Ehren von Erich Poppe. Studies in honour of Erich Poppe (Berlin, 2011), 107-115. Reports of 15 out of Meyer’s 18 lectures were carried in the Glasgow Herald (with an occasional report in the Scotsman). From these it seems that Meyer gave three courses or series of six lectures. The first series of Meyer’s lectures, six in total, were given on the broad theme of ‘The Celtic Church of Britain and Ireland’ (18 & 25th January and 5th, 9th, 16th & 23rd February 1904). The second series of Meyer’s lecture series, six in total, were given on the theme of ‘The origins of Celtic literature’ (25th & 30th Nov., 9th & 12th Dec. 1904 and 2nd & 10th March 1905). Meyer’s third and final series of six lectures on the broad theme of ‘the Influence of Celtic Literature on that of Europe,’ (3rd, 10th, 17th & 24th February and the 2nd & 10th March 1906). Glasgow Herald, 14/01/1904, p.7; 19/01/1904, p. 10; 23/02/1904, p. 10; 26/11/1904, p. 6; 19/02/1906, p.10; 26/02/1906, p. 10; 05/03/1906, p. 10; 12/03/1906, p. 12. Glasgow University Archive Services [GUAS], Press cuttings, GUA IP 6/1/11 nos. 5-6, 7, 8, 11, 22, 71, 97, 100. GUA IP 6/1/13, nos. 46-47, 48, 52, 53, 54. A listing of the lectures that have been identified from newspapers and from press cuttings can be seen by clicking on the following link to a PDF file: Meyer – lectures in Glasgow. For Meyer and the Ossianic Club, see, GUAS, Sen 10/46 Glasgow University Calendar for the year 1904-5, p. 761. A report of an address by Meyer to Comunn Gàidhlig Ghlaschu, 5th March 1905 was carried in the Scotsman of the following day. Meyer was reported to have said, in his final lecture at the University of Glasgow (10/03/1906) “[that] it had been a great pleasure to him to deliver the course of lectures, and the pleasure was enhanced by the knowledge that the lectureship which he had temporarily held was henceforth to be held on a more permanent footing and that there was every prospect that the study of Gaelic language and literature would strike firm roots within the walls of the University and grow and flourish and bear fruit” (Glasgow Herald, 12/03/1906, dg. 12). A letter, Principal Robert Story to his friend, Lady F. Balfour, 18th February 1904 refers to Meyer: “…Kuno Meyer, whom you saw and heard with us from Saturday till Tuesday. He is very good company, and I think one result of his lectures will be the creation of a permanent Celtic lectureship which will remove a reproach….” [F. Story and H. C. H. Story], Memoir of Robert Herbert Story, D.D., LL.D., Principal and Vice-chancellor of the University of Glasgow, one of his Majesty’s Chaplains in Scotland by his daughters (Glasgow, 1909), 358-359. Professor Thomas Clancy discovered a letter from letter from Meyer to Story, 11th October 1905. T.O. Clancy, ‘Die like a man?’ in Aiste, 2 (2008), 70-93, at 91. For references to Kuno Meyer as ‘German master-spy’, as Professor Angus Matheson put it, see, Schlüter, ‘Kuno Meyer in Glasgow’, n. 15, and A. Matheson, ‘The Department of Celtic in the University of Glasgow,’ in Ossian, 1957, 23-26, at 24. For a short account of Meyer’s life and career (albeit with no reference to Glasgow) see A. Breen, ‘Meyer, Kuno’ in the Dictionary of Irish Biography (Cambridge University Press & The Royal Irish Academy, 2014). The campaign to fund the lectureship, 1905-06 and the Fleming bequest. GUA 74039, 74040 (Senate minutes, 1905-1906). Sen 1/1/20/172-178 (University Records, Minutes of Senate, 15 March 1906). GUA 5644, (Papers concerning the MacCallum Celtic Lectureship, 1906-1911). GUA 72718b (Papers relating to Alexander Fleming’s Trust). Glasgow Herald, 18/10/1909, p. 9 & 15/12/1909, p. 8. Glasgow Highland Society, Rules and Regulations and lists of members (Glasgow, 1902), 69. According to the entries in the census returns, 1891 & 1901, Fleming could not speak Gaelic. These returns stated that he had been born at Kilchenzie in Kintyre as had his servant, Flora Milloy, a cook. Flora could speak Gaelic. A. L. Brown & M. Mosse, The University of Glasgow: 1451-1996 (Edinburgh, 1996). 35-36, 71-72, 118. Mary Anne MacLaine, a native of Glasgow, took classes in English, Latin, French, Logic, Mathematics as well as Celtic during her time as a student, 1906-1911. Although she won a prize for her efforts in Henderson’s Gaelic class she left the University without graduating. GUAS, GUA R8/5/28/10. GUA R8/5/31/10. Mary McLaine was the secretary of An Comunn Oiseanach, 1908-09. GUA Sen 10/50, GU Calendar (1908), p. 755. GUAS Sen 10/53, G.U. Cal., 1911-12, p. 590. Abandoned student files, ‘Mary Anne McLaine, Glasgow,’ GUAS, R6/58. References to the Rev. Dr George Henderson. Glasgow University Archive Services [GUAS], Sen 1/1/20/219, University Records, Minutes of Senate, 5 June 1906. Celtic Review, viii, 1912-13, 246-7. Glasgow Herald, 13/04/1906, pg. 9. Glasgow Herald, 29/06/1906, p. 4. Professor Donald E. Meek, From Magnus Maclean to Angus Matheson. The first Angus Matheson memorial lecture, University of Glasgow, 5 December 2006. Glasgow Herald, 13/04/1906, pg. 9 and GUAS, GUA 34404. The Glasgow University Calendar for the year 1907-8 (Glasgow, 1907), 80 (This accessed at GUAS, Sen 10/49). References relating to the Rev. Dr George Calder. GUAS, Sen 1/1/22/198 University Records, Minutes of Senate, 10 October 1912. GUA 74046. Senate meeting papers, 1912. D.S. Thomson, ed., The Companion to Gaelic Scotland (Gairm, Glasgow, 1994), 30. D.E. Meek (deas. ), Mo Là gu Seo. Eachdraidh mo Bheatha, le Tòmas M. MacCalmain (Comann Litreachais Gàidhlig na h-Alba, 2011), 145-6, 207. Celtic Monthly, 20 (1912), 211. Professor Donald E. Meek, From Magnus Maclean to Angus Matheson. The first Angus Matheson memorial lecture, University of Glasgow, 5 December 2006. For some of the reception of Calder’s work see, The Celtic Review, 4 (1908) 287-8. Journal of the Royal Society of Antiquaries of Ireland, 37 (1907), 312-313. M. Herron, ‘Some new light on the life of Virgilius Maro Grammaticus’ in the Proceedings of the Royal Irish Academy. Section C, 79 (1979), 27-71, at 51, 53, 64-65. E. Poppe, ‘Imtheachta Aeniasa: Virgil’s “Aeneid” in Medieval Ireland’ in, Classics Ireland, 11 (2004), 74-94, at 78. For a review of Calder’s ‘Togail na Tebe’ (1922) by an ‘OJB’, see the Irish Quarterly Review, 12 (1923) 320-323. For an appreciation of Calder as a teacher by J.C. (John Cameron) see, An Gaidheal, 36 (Ceitean, 1941), 107-108; and also ‘The M.A. in Gaelic,’ in An Gaidheal, 27/1 (an Dàmhar, 1931), t.d. 14. Glasgow Herald, 2nd April 1941, p. 9. For annual Gaelic religious services at the University see the Glasgow Herald, 01/02/1926, pg. 7; 17/02/1930, pg. 13; 14/12/1931, pg. 10. For Calder as minister of Strathfillan, 1894-1912, and for details of his family see FES, iii, 369. For the patterns of speech in Strathfillan at this time see a report by Kurt C. Duwe, who states that 86.5% of the parish were Gaelic speakers in 1881, falling to 79.0% by 1901. Duwe’s report available online here. Donald E. Meek, From Magnus Maclean to Angus Matheson. The first Angus Matheson memorial lecture, University of Glasgow, 5 December 2006. D.S. Thomson, ed., The Companion to Gaelic Scotland (Gairm, Glasgow, 1994), 304. [11a & 11b] Donald E. Meek, From Magnus Maclean to Angus Matheson. The first Angus Matheson memorial lecture, University of Glasgow, 5 December 2006. D.S. Thomson, ed., The Companion to Gaelic Scotland (Gairm, Glasgow, 1994), 197, 214. For a short but detailed account of the life, career and accomplishments of Alexander Nicolson (alias Ailig MacNeacail, 1884-1966), see N. Macdonald & C. Maclean, The Great Book of Skye. From the Island to the World. People and place on a Scottish Island (Portree, 2014), 288-89, 435-437. See also an account by Dr Andrew Wiseman available on the internet on the ‘Calum Maclean blogspot,’ by clicking here. Thanks to Dr Aonghas MacLeòid, formerly a student at Roinn na Ceiltis, for these references. Thanks also to Mr Gilleasbuig Domhnallach, Riochdaire, BBC Radio nan Gaidheal, for information. ‘Memorial by Committee of the Glasgow University Ossianic Club with reference to the establishment of a Chair of Celtic at Glasgow University,’ GUAS, DC 8/744. Sir H. Hetherington, ‘Foreword by the Principal,’ in Ossian (1957), 3. Litir, John Maclean (Iain MacGhill’Eain), ann an ‘Cabarfeidh, Oban’ gu Mr Kenneth Macdonald (Coinneach Domhnallach), Roinn na Ceiltis, 8/7/70. Chaochail Iain MacGhill’Eain 21/09/1970. Tha an litir air a gleidheadh ann an tasg-lann DASG. Celtic Department Roll Books. For information on Professor Derick S. Thomson (alias Ruairidh MacThòmais) see R. Black, ed., An Tuil. Anthology of 20th Century Scottish Verse (Edinburgh, 1999), 784-787. See also D.S. Thomson, ‘Derick S. Thomson, born Isle of Lewis, 5th August 1921. Academic & Poet. Saltire Book of the Year, Creachadh na Clàrsaich, 1983. Some Recollections.’ In, P.H. Scott, ed., Spirits of the Age: Scottish self-portraits (Saltire Society, Edinburgh, 2005), 55-67. Glasgow Herald, 29/09/1966, pg. 15. S.M. Kidd, ed., Baile Mòr nan Gaidheal. City of the Gaels (Oilthigh Ghlaschu, 2007), iii. D.S. Thomson, ed., The Companion to Gaelic Scotland (Gairm, Glasgow, 1994), 169. For information on Professor Donald MacAulay (alias Dòmhnall MacAmhlaigh) see R. Black, ed., An Tuil. Anthology of 20th Century Scottish Verse (Edinburgh, 1999), 798-9. Information from Mr Iain Dòmhnallach and also from S.M. Kidd, ed., Baile Mòr nan Gaidheal. City of the Gaels (Oilthigh Ghlaschu, 2007), iii.